The head of Sudan's military council has stood down a day after leading a coup that toppled long-time leader Omar al-Bashir amid a wave of protests. Defence Minister Awad Ibn Auf announced his decision on state TV, naming as his successor Lt-Gen Abdel Fattah Abdelrahman Burhan. But protest leaders say they will not leave the streets until the military hands over to a civilian government. Mr Bashir's downfall followed months of unrest that began in December over rising prices. 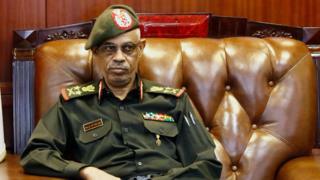 The new man in charge is also a top military figure, but the Associated Press news agency reports that his record is cleaner than other Sudanese generals. He is also said to have met with protesters to hear their views. However, the military council has said it will not extradite Mr Bashir, who denies the charges, although he may be put on trial in Sudan. How did the latest drama unfold? Despite Mr Bashir's removal on Thursday, demonstrators had refused to disperse, camping out outside army headquarters in the capital, Khartoum, in defiance of a curfew. In its first response, the military council came out and denied it was seeking power, telling the protesters that they would decide the country's future, while the army maintained public order. A few hours later, Mr Ibn Auf announced he was resigning and would be replaced by Lt-Gen Burhan. "In order to ensure the cohesion of the security system, and the armed forces in particular, from cracks and strife, and relying on God, let us begin this path of change," he said. 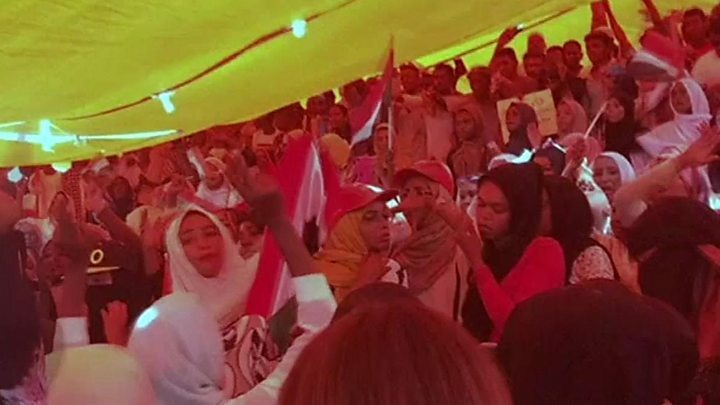 Protesters celebrated his abrupt departure but the Sudan Professionals Association, which has been spearheading the demonstrations, later announced that the sit-in would continue. "We call on the armed forces to ensure the immediate transfer of power to a transitional civilian government," they said on Facebook. They further called for the abolition of "arbitrary decisions by leaders that do not represent the people" and the detention of "all symbols of the former regime who were involved in crimes against the people". "Until these demands are fully met, we must continue with our sit-in at the General Command of the Armed Forces," the SPA said. Meanwhile, police said at least 16 people had been killed by stray bullets at the protests on Thursday and Friday. The regime has floundered since this phase of protests began. The old ways of coercion haven't worked and they face a civil society that is well organised and disciplined. This is a further retreat. It is unlikely to be the last. And there's the economic crisis brought about by misrule, corruption and loss of oil revenues. Even the regime's friends in the Middle East and Asia will think twice about rescue packages if it looks like a new version of the old venality and brutality. That's an important pressure. This is an exciting moment. Just think about the role of women in all of this, of social media and civil society. It's happening in Sudan but the significance of these forces working peacefully for change is universal. Yes it's very precarious, but also full of possibility.